The construction site of the concrete mixing plant is large and the site is open. In the restricted-contracted section of the mountainous area where land is used, the construction of the concrete mixing plant is adapted to local conditions and the layout is reasonable. 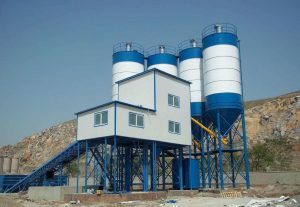 According to the project needs, the mixing plant sets a plurality of storage bins with the capacity to meet the requirements, and the material of different specifications is stacked in sections, and clearly identifies various material names, specifications, quantities, quality status and other information on the partition walls; The canopy is made of hard concrete cement concrete, with a horizontal drainage slope of not less than 4%. The drainage system inside the warehouse is perfect and the site is clean and tidy. According to the need to set up a collection silo, and to be examined warehouse floor materials. Silo weather shelter under construction. Concrete partition wall thickness and height standards. Mixer feed hoppers are equipped with enclosed weatherproof sheds (some feed hopper canopies are connected to the aggregate silos canopy) to prevent aggregates from being wetted by rain on the feed hoppers and to ensure the stability of aggregate moisture content; Set conspicuous aggregate specifications and aggregate bin numbers on the feed hoppers and weatherproof sheds to facilitate corresponding loading and prevent incorrect loading from affecting concrete quality. According to the width of the feed hopper, the method of narrowing the width of the hopper on the forklift is adopted to match the width of the feed hopper of the mixer to prevent stranding problems during loading of the forklift. The feed hopper is connected to the silo canopy. Feed hopper enclosed rain canopy. The hopper mark is clear. Narrow the width of the hopper on the forklift to match the width of the hopper of the mixer. (1) The concrete mixing plant is equipped with a mixing water cooling circulation system to reduce the temperature of the concrete exit. (2) The water cooling system is set outside the cement storage tank, and water is poured on the outer wall of the tank regularly to achieve the purpose of reducing the cement temperature in the tank. (3) Each mixing machine is equipped with 6 cement storage tanks, which are recycled and used to reduce the temperature of the cement by prolonging the storage time of the cement. This entry was posted in Solution and tagged concrete plant setup suggestion, ready mix concrete plant setup cost, schwing stetter batching plant price by camelway. Bookmark the permalink.